All classes are taught by certified US Sailing Instructors. Closed-toe shoes with soft sole and ability to get wet, hat, bathing suit, towel, sunglasses, refillable water bottle, backpack and sunscreen for reapplication throughout the day. We also encourage you to bring a US Coast Guard approved PFD (life jacket.) However, PFD's will be supplied should you not have a personal PFD. Sailing helmets are recommended, but not required. A limited number of helmets will be available for rent. Please be sure to write your child's name on all personal belongings. Do you have any prerequisities for camp? Yes, campers must be able to swim with a life jacket on. Will lunch be provided for the campers? Yes, lunch will be provided for $40 per week. Pizza (Mon, Fri); Sub sandwiches (Tues, Thurs); Cookout on Friday with hamburgers/hotdogs. Campers electing to bring lunches from home should bring a cooler to keep food chilled. Will care for my child be available before or after standard camp hours? Morning care is available begining at 7:30am for $40. After care is available from 4 to 5:45 pm for $40. 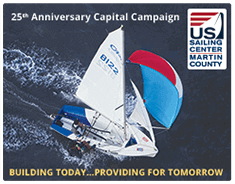 Where is the Sailing Center located? The Sailing Center is located in the Indian Riverside Park. Our address is 1955 NE Indian River Drive, Jensen Beach, Florida 34957. Our two-story waterside facility is located on the Indian River Lagoon. Classes may be changed up to one week prior to the first day of camp for no additional fee. Changes made within the week will be charged a $25 change fee.